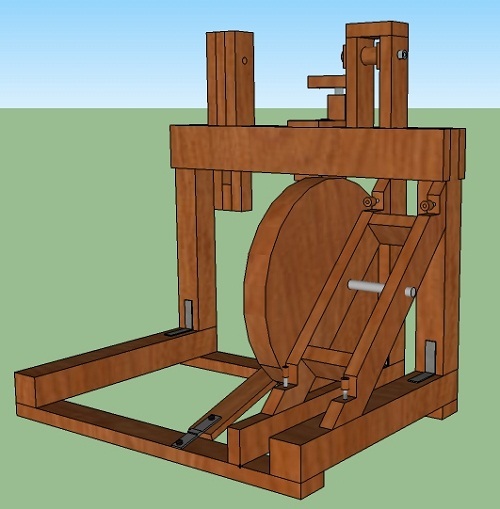 Here's an inexpensive, portable treadle lathe design that you can make in a couple of weekends, out of scrap wood, and some relatively inexpensive hardware. But don't let the quick build time fool you. The simple design of this heavy duty shop built lathe makes it as easy to use as it is to build. Whether you are looking for a daily use lathe, a conversation piece, or want to turn using the sweat of your brow, this is the lathe for you. Woodworking has been a lifelong passion of mine. It all started one cold Christmas morning when I was 6 years old. Santa Clause left a present under the tree that sparked a fire in me that still burns. Wrapped in paper with his image, topped with a golden bow, my first tool kit awaited. My first set of tools consisted of a tiny tack hammer, and what I know now as a coping saw. To a 6 year old boy in footed pajamas', it was everything. The kit also included a few pieces of 1/4 plywood, tacks, and plans for a birdhouse. My Father, with unforetold patients, helped me build my first project. I was amazed to finally see the lopsided masterpiece that was described by some to be a birdhouse. Over the last 25+ years, the tools have gotten bigger, better, and more expensive. I bought my first lathe about 10 years ago. I used it mainly for table legs for furniture in my house. Before long, I began to versify my turnings to include bowls, boxes, bottle stoppers, pens, pencils, and plates. I shortly realized I was hooked. Whenever possible, I go straight to the lathe to search for the form resting in a piece of green wood. To me, there is no greater pleasure, in terms of woodworking, then turning a freshly cut log. The wood peels away like butter. As the long shavings pile up on my arm and shoulder, the stresses and worries of the day seem to melt away. Today, most of the items that I turn I sell on my website or at local craft show. I do around 4 shows a year and love every second of it. Meeting people who enjoy my work is extremely rewarding. I like to see the puzzled look on people's faces when they try to imagine how I create some of my pieces, or when they pick up a pen made out of a pine cone and try to imagine what it could be made from. I enjoy sharing my ideas and knowledge with other people. At shows, I spend a great deal of time explaining how I create my pieces on the lathe. In that light, I decided I need a lathe to take with me and demonstrate my craft. Unfortunately, some of the shows that I attend do not provide electricity to the booths. This dilemma was on my mind during last year's family trip. I took my wife and son to colonial Williamsburg Virginia. Walking through the brick streets, we came across a small cabinetmakers shop. There, just inside the door, against the wall, stood an old treadle lathe and the answer to my problem. I decided then that I needed to build one. After research the different types of human powered lathes, bow, pole, and even some using bungee cords, I decided on a treadle lathe using a flywheel. The continuous action treadle lathe, also known as a flywheel treadle lathe, is an old design. 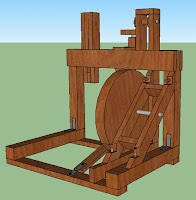 Leonardo Da Vinci was the first to design such a lathe almost 500 years ago. 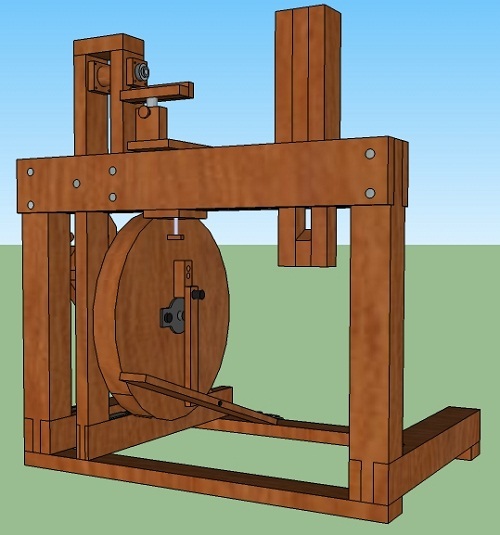 His design included a 6' flywheel to drive the spindle. Although highly effective and efficient, a 6' wheel is not practical for limited space. In this case however, bigger is better. The flywheel transforms your energy, the up and down motion of your leg, into rotational motion. Once the wheel is in motion, it stores your energy. This means that the larger the wheel diameter, the greater the energy storage potential is for that machine. Additionally, adding mass around the rim of the wheel increases the energy of a wheel. So Leo's machine would make for a very nice lathe. Although it may appear crude and dated through the eyes of a 21st century woodworker, the continuous motion treadle lathe was a giant leap forward in its day. Da Vinci was arguably one of the greatest inventors of all time. Turning times where greatly decreased with such a design. Before his revolutionary design, turners using a pole lathe or bow lathe spent ½ of their time watching the work spinning in the wrong direction. This seemed too tedious for me. I drew inspiration for this build from many sources. The lathe I built was based, primarily, from a lathe designed by a great woodworker, Roy Underhill. Roy has a TV show on PPS called The Woodwright's Shop. Although not as "pretty" as some, I liked the simplicity and ease of build that Roy's design offered. However, I needed to make my lathe design better suited to my needs. I decided my design needed a few key ingredients. I built my lathe for one purpose. I wanted an attention grabber to take to craft shows. This was not some stretch to remember the past, find my roots, or decrease my greenhouse gas output. Although I think all are important, this specific project was only for attention. Additionally, I am not a purist wood turner. I'll employ any means, tools, or tricks to get a desired result. When I go to the shop to turn wood, I'll still be using my 2hp 220-volt electric motor to power my piece. Then, all I have to think about is turning wood. But when time permits, it is a lot of fun to turn on this lathe. There is definitely something to be said about creating something with manpower alone. While designing this build, I had several things in mind. First and foremost, I needed the lathe to be portable. Many of the designs that offered portability seemed to require a lot of time assembling the lathe. Moreover, many of the designs required wrenches and other tools to assemble and disassemble the lathe. The lathe I built sets up extremely fast and doesn't require tools to do so. It hinges instead of disassembles. It is this hinging action that allows for fast setup and teardown times. Additionally, it is not complex. It has only two parts to put together, and does not require me to haul a box of wrenches with me to a show. The second requirement for me was that the lathe, when collapsed, had to be small enough to fit in my micro-sized car. Going from a pickup truck to a small economy car has been a challenge. But I get to pass a lot of gas stations with it, and that is great. After folding the lathe up for transport, I can tuck it into the back seat in just a few short minutes. The third and final major item of concern for me was chucks. Yes, I want to use my chucks, spur drives, and live centers on the treadle lathe. I know it seems ironic. Building an old style lathe that uses new technology. I am a wood turner, not a historian. Therefore I feel no shame in combining old and new technologies. To easily and economically accomplish this requirement, I decided to use the same bearings and spindle as my grizzly lathe. I got out my manual and gave them a call. I ordered the two bearings and the spindle to fit my lathe. When they arrived, I removed the old bearings and spindle. After adding the new bearings and spindle to the Grizzly lathe, I went back to work on the treadle lathe. I reused the old parts in the headstock of the treadle lathe. However, if you want to go more traditional, you can use a steel rod pounded into the shape of a spur drive for the headstock spindle. Instead of a live center, a second piece of steel rod can be added to the tailstock. File it down to a point and your good to go. Building this lathe was a pleasure. It doesn't involve precision dovetail joinery. It doesn't take cabinetmakers skill to construct. This can be made in a short amount of time, with very limited tools and woodworking skills. The entire build can be done with hand tools alone. I built mine in just a few weekends using almost all recycled material and very little expense. A thrifty builder could almost do it without spending a dime. I was fortunate enough to come across the majority of the required supplies within my own shop. Last spring, my wife and I decided to tear down a gazebo in our yard to make room for a patio. I built the gazebo several years before out of pressure treated 2x4's and 4x4's. After lightly sanding the wood, I quickly realized that it had great potential for a lathe. It is strong and lightweight, it already has a well worn rustic look, and best of all, I had another opportunity to reuse material. The majority of the lathe was built using this recycled wood with the exception of the ways and the wheel. For the ways, I decided on standard 2x6 pine. Although this is overkill, I wanted to ensure lateral stability in the structure. The wheel was constructed of two layers of ¾” pine, scavenged from an old coffee table, and one layer of 1” thick cherry. Additionally, I did opt to use a little hardwood here and there. I used a small length of 4x4 oak for the drive spindle, a piece of cherry for the treadle, and a few scrape pieces of maple for the tool rest. I did need to purchase several items from the local hardware store, and mail order others. The steel rod, hinges, rope, nuts, washers, and bolts where all purchased locally. The bearings and spindle where purchased as replacement parts from Grizzly. I had to order the flange bearings and shaft collars from Surplus Center. The part numbers for all of these parts can be found in the parts list in this article. Building this lathe was easy and inexpensive. It can be used for any type of turning that you plan to do. Although I built mine as a show piece and a novelty turning lathe, you can build one to suit your own needs. None of the dimensions on this build are critical. The swing can be increased or decreased for your own needs by altering the height of the headstock. The bed can be lengthened or shortened by adding length to the ways and base. The wheel can be made bigger and heavier to increase the mechanical advantage of the machine. If this is done, the fastening point of the wheel axel may need to be moved to give the wheel clearance. I would not recommend you make the wheel any smaller than 21” diameter. Using this lathe is a lot of fun. I will tell you, it takes some getting used to. Don't expect to just jump in and finish a bowl as you do on a conventional lathe. This takes some patients to learn. You have to build a rhythm with your foot while controlling your tool. Don't let this discourage you. It is not difficult to learn, and it really doesn't take a lot of muscle. Just remember to use sharp tools. I would like to thank you all for sharing in my treadle lathe project and I invite you to visit us at WoodChux. The full set of plans is available there for free, along with other free plans and information. This is my website containing the free step by step plans to build this lathe. I also have other step by step plans, information, photos of my work, contact information, and woodturning supplies for sale. Roy is an amazing woodworking. He has a TV show on PBS called The Woodwright's Shop. He is what I would call a purist woodworker. He uses only hand tools to do his work. He is a great craftsman. I purchased the spindle and spindle bearings from Grizzly's parts department. They are replacement parts for my Grizzly G5979 wood lathe. I purchased my wheel bearings and 1/2" shaft collars here.